Jim Moore launched a new Web site for O.E. Wheel Distributors. The Sarasota-based company, which Moore founded, no longer relies totally on eBay for sales. We had to find something else. We had to find a way to make new money. Jim Moore knew the lack of a diversified business stream was potentially toxic for his decade-old tire and wheel business. In early 2009, however, the theoretical worry nearly morphed into reality. That’s when eBay, the lone source of sales for Moore’s company, Sarasota-based O.E. Wheel Distributors, began to change several of its polices and procedures. The upshot of the changes was Moore and his staff had to individually tinker with each of the 14,000 auctions for custom-made wheels the firm ran through the site a day. The auction Web giant and Moore’s niche’ business had been good to each other. O.E. Wheel, which designs and manufactures wheels for nearly every car on the market, from Acuras to Volvos, surpassed $25 million in revenues in 2008 after five consecutive years of at least 10% annual growth. Just as scary: Company revenues in 2009 are down more than 20%, a byproduct of the recession that Moore says was compounded by the eBay changes. In response to the changes and sales drop-off, Moore instituted two major changes at O.E. Wheel, which stands for Original Equipment. First, in a traditional phone and brick-and-mortar kind of way, he launched a wholesale division to sell the company’s custom made products directly to small and mid-sized retailers in the U.S., Canada and Mexico. He even hired a bilingual salesman charged with growing sales in Mexico and Puerto Rico. The results of the diversification effort transformed O.E. Wheel, which still runs eBay auctions, only less than it has in several years. For starters, Moore projects the company will reach at least $25 million in 2010 sales. That’s courtesy of the wholesale division, which brings in $500,000 a month and Internet sales, which Moore says is good for $250,000 a month. And the company now has an opportunity to be a big player in the tire and wheel aftermarket, which could be both profitable and open doors to bigger sales. That would include selling its products in national auto parts and tires stores, says O.E. 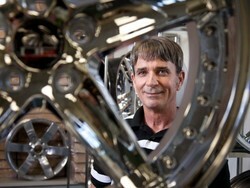 Wheel operations manager Lance Bullock. That presence will take more than a new Web site. O.E. Wheel, Bullock says, will also have to increase its liability coverage by at least $7 million in order to compete on a national scale — no easy task in a low margin business. Moreover, Bullock says the company is in its infancy stage when it comes to certain technology elements. For example, most of the departments within O.E. Wheel use separate software programs, many of which aren’t compatible with each other. Bullock says he’s close to buying a software package that will tie all the departments together. Even with the diversification, the crux of the business model at O.E. Wheel remains the same: Moore, a lifelong car guy, creates dozens of designs he turns into custom replica wheels for a variety of cars and trucks. Products range in price from less than $20 to more than $1,000. But the unique designs, Moore says, is what draws people to pay several hundred dollars to upgrade a standard set of wheels or tires. >>>This article was written by Mark Gordon, Managing Editor of the Gulf Coast Business Review.